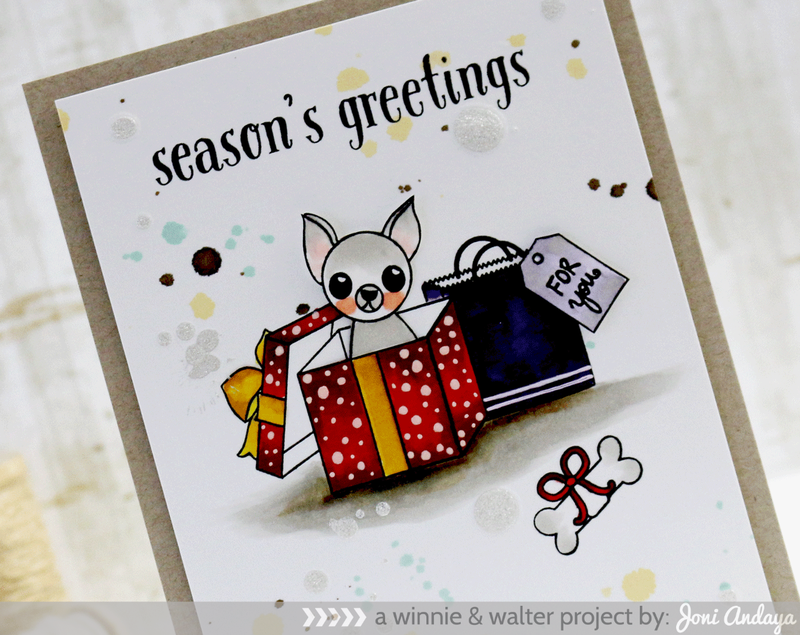 Hello Everyone...today marks the Day 4th release preview of Winnie & Walter October release. Remember all the new products will be available for purchase tonight 8pm (CST). I really love this stamp set I used on the card its called Stampets: The Gift stamp set. To begin the card I first stamped the box first, then mask the gift box and mask the gift bag, to make it look like its behind the gift box. 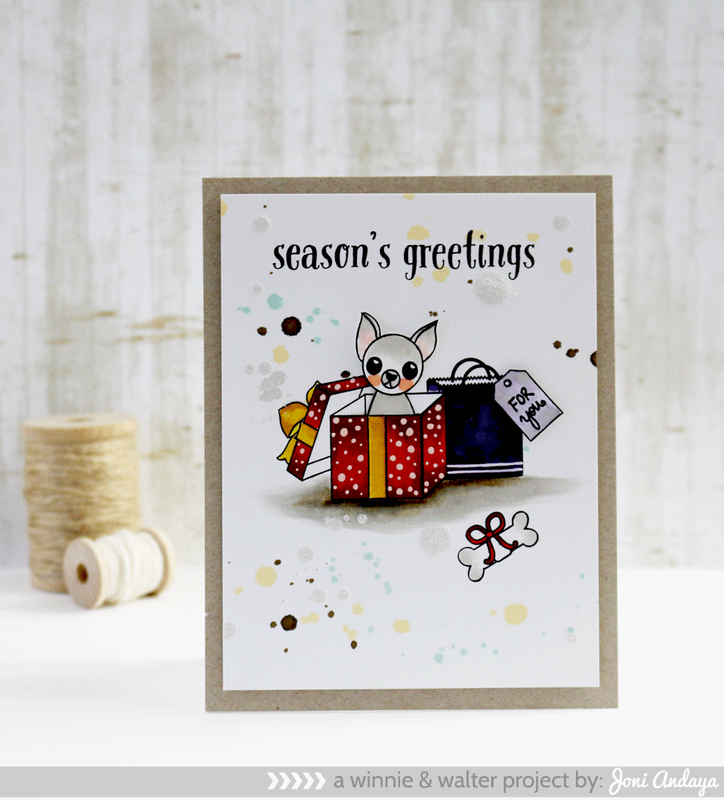 The cute Chihuahua is stamped on a separate cardstock and fussy cut. I cut a slit on the top of the gift box where I inserted the Chihuahua in the box. Next, I added some white gel pen on the box to add the dots and 2 lines on the gift bag. I also fussy cut the tiny tag "for you" also included on the stamp set. The dog bone image is also from the set, but the sentiment is from the Winter Woodland stamp set. I also added some shadows using Copic markers at the bottom of the gifts to ground it. Next, I added some ink splatters to finish off the card. Soooooooo adorable! LOVING that doggie!!!!!!! This is so cute Joni. What a fun card - beautiful coloring on your packages! Awwww this is adorable, what a sweet little image! Beautiful coloring :) love those cute images ! Oh orr heavens sake! Too cute!!! Joni, this is so much fun! This was very creative, I need to start working with copic markers.. So cute! Love how you are always able to step everything up a notch by your fabulous details. Oh my! Could this be any more adorable? Love your coloring as well as your shading, the splatters...well, EVERYTHING really! This just makes me smile! So adorable, and great stamping! Love how you added Fido inside the box, and love the accents you added with the white pen. Your coloring and the random splots on the background are really wonderful, too!